Banbha Fódla Éiriu: Ainu Language, Possible Similarities? Léis na físeanna séo tá mé ag iarraidh na cosúlachta idir na teangaí proto-ceilteach agus an teanga Ainu a fiosrú da bhrí raiteas diamhar go raibh gaol idir na teangaí. Is chultúr seanda oileánach é chultúr na hAinu agus ag, an am séo, níl aon gaol ar bith idir an teanga Ainu agus teanga ar bith eile. Eist leis an bhlás ar an fís 'Ainu' seo, bfheidir go bhfuil eolach ar? Here's a little linguistic curiosity for all you familiar with the Irish language. 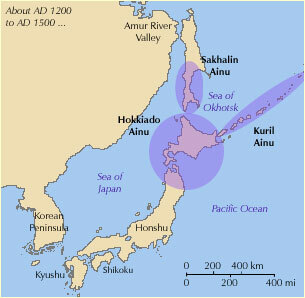 The Ainu, or the 'hairy Ainu', are an ancient insular indigenous race inhabiting the northern islands of Japan. Ainu has no accepted genealogical relationship to any other language family, yet, I just heard an off-hand remark about how their language was unique to the area but seemed to share a lot in common with proto-celtic languages. That would be a head-scratcher as they are an ancient people on the other side of the globe!